Like most pet owners, I consider dogs and cats to be important parts of the family. My dogs ruled the roost around here, especially when we had three of them at once! Although we don’t have any pets in the house these days, we get to see our grand-dogs, grand-cats, and all the pets in the Ageless Paws family fairly often. And we certainly enjoy spoiling them with lots of love and plenty of tasty treats when we do. The giving of said treats, however, can be complicated. Of course we want to shower our furry friends with praise, and what better way than to give dogs and cats what they love most? But like humans, pets can develop weight problems if they eat too many unhealthy foods. And the sad truth is, most pet treats available at big-box retailers are nothing more than “candy”—junk food filled with animal byproducts, grains and other fillers, not to mention artificial flavors and preservatives. Those treats are anything but healthy, and eating them too often can lead to obesity, joint problems, and digestive issues. I feed my human family a healthy, nutritious diet (called the Pan-Asian Modified Mediterranean diet or PAMM, for short), and I believe pets also deserve the best we can get for them. That is why I now offer freeze dried pet treats at Ageless Paws. Freeze dried animal food and treats are just now starting to hit the mainstream, and for good reason – they’re super convenient and can be very healthy (such depends on the ingredients). Admittedly, I’m a bit of a prepper, and personally have a long history of keeping freeze dried foods in my house. For decades, I’ve researched the best emergency food supply kits and made sure our basement was well stocked with all the necessities, including a variety of freeze dried foods to keep us nourished in case anything crazy or catastrophic ever happened. I learned long ago that freeze drying is one of the best preservation methods to retain flavor and nutritional content of food. In fact, NASA has nourished astronauts in space for decades with freeze dried meals. That’s why I think freeze dried foods are the best treats for dogs and cats, as long as the foods are healthy for dogs and cats in the first place…foods like all-natural meats, poultry and fish, and fresh fruits and veggies (except grapes, onions, and garlic – learn more here about human foods that are dangerous for pets). Freeze dried foods bring several benefits to the table. It all comes down to the “simplicity” of the preservation process. Freeze drying preserves food by removing its water content. First, the food is flash frozen at an extremely low temperature, which helps to retain not only its physical integrity but also its nutrients. Next, the moisture is removed using a vacuum process called sublimation, where heat is added so that the water evaporates. This removes about 95 percent of the water. During the final phase of this process, secondary drying (adsorption) occurs, which eliminates as much of the remaining water as possible. Freeze drying is a very safe and effective way to preserve food. It removes so much moisture that it basically stops the decay of the food, without damaging or altering any of the meat’s nutritional value. No chemicals, preservatives, or other additives are used, simply because they’re not needed. Microorganisms like bacteria need water to survive. But with the removal of water, bacteria are naturally kept at bay. Freeze dried pet treats usually contain minimal ingredients—often just the meat itself. This is a boon for animals that have sensitive stomachs or allergies and need to be on restricted diets. Freeze dried treats are also extremely shelf stable, easy to store, and even easier to grab on the go. And you get more bang for your buck. Eliminating the water content reduces the weight and size of the final product. For instance, one pound of freeze dried chicken treats may actually start out as five pounds of wet meat before the freeze drying process. This means your pet gets more protein and other nutrients in each bite than he would with traditional treats—and probably also eat less overall. There’s nothing more natural for all animals—domestic and wild—than to eat raw meat. It’s what dogs and cats have historically consumed in the wild for millennia. Only in the late 1800s did people start feeding their dogs cooked meats to make them more “civilized,” and not long after, the burgeoning pet food industry took the reigns. Though pet food manufacturers would like you to believe that processed kibble has all the nutrients our furry friends need, in reality raw, unadulterated meat contains levels of vitamins, minerals, essential fatty acids, enzymes, and antioxidants that far surpass typical pet food. Your first thought may be, “But Dr. Sinatra, what about food-borne illness?” Yes, this is an issue for humans. But dogs in particular have evolved to be very tough. Considering the length of time their ancestors consumed nothing but raw meat, today’s dogs have digestive systems that are strong enough to handle various pathogens without getting sick. That being said, while some veterinarians encourage raw food diets, others believe that they are not advisable due to the risk of bacterial contamination. Since freeze-drying removes the moisture that allows bacteria to grow in the first place, I feel that freeze dried raw meats are much safer bets than fresh raw meats, poultry or fish. Also keep in mind, raw food treats and diets may not be appropriate for all animals (such as those with liver, kidney, or pancreas issues, or with compromised immune systems). For most, I believe they are perfectly fine and quite healthy. There are many options when it comes to freeze dried pet treats. Here are some tips to help make the best choice possible. Check the label to make sure the product is made with all natural, antibiotic- and hormone-free meat or poultry raised in the USA or wild-caught fish (as fish on farms are often raised with antibiotics, pesticides, and other chemicals). The product should also state that it contains no sugar, salt, grains, or other additives/fillers, or artificial colors, flavors, or preservatives. Some freeze dried products are supposed to be rehydrated with water prior to serving, while others that come in small cubes can be given without rehydrating. If you do rehydrate, it will be more filling for your pet, so be sure not to overfeed. If you want to give your pet a taste of freeze dried without breaking your budget, try supplementing their usual diet with a “topper.” Freeze dried then ground into a fine powder, you can sprinkle as little or as much of this delicious treat over your animal’s food. Handle raw treats with care. Keep them sealed and wash your hands after touching them. 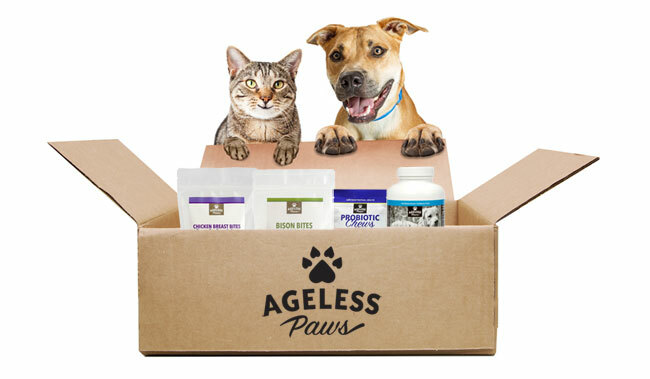 Here, at Ageless Paws, we offer freeze dried treats for dogs and cats that are made with just one clean, raw ingredient each: chicken breast, bison liver, turkey heart, or wild Atlantic salmon. That’s it – no funny stuff, just the pure meat nutrition dogs and cats love. If you’re wondering whether these healthy treats actually taste good, check out what happy pet parents across the U.S. have to say about Ageless Paws freeze dried treats. © 2018 Ageless Paws and Vervana. All rights reserved.